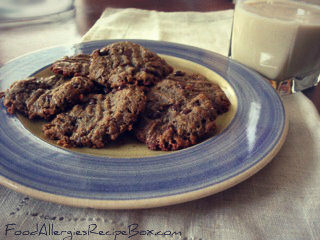 Peanut Butter Alternative Chocolate Chip Cookie Recipe! I love sunbutter cookies! This sunflower butter is a great peanut butter alternative for delicious chocolate chip cookie recipes! With the addition of Chia Seeds to this recipe we are also adding omega-3 fatty acids, protein, fiber, vitamins and minerals! I also opted to use vanilla hemp seed milk to this recipe which is a creamier milk alternative you can use other milk alternatives however the results may vary slightly. We use Enjoy Life Brand Chocolate Chips, so far they are the only chocolate chips we have come across that are dairy, nut and soy free. Remember to always read the label before purchasing. Please let us know if you find any other allergy safe chocolate chips! Share your experience with peanut butter alternative recipes on Facebook or Contact Us Here! Ingredients for Peanut Butter Free Chocolate Chip Cookie Recipe! Start by placing chia seeds into a cup with vanilla and hemp seed milk, stir and set aside allowing to soak for 5 minutes. In a medium size mixing bowl combine sun butter (PB alternative of your choice) and soft brown sugar, place in microwave and heat for 30 seconds to 1 minutes until soft. Mix ingredients together. Add chia mixture to peanut butter free mix and add salt. Mix ingredients then add in chocolate chips and stir well. Place raw cookie dough into the freezer for 30 minutes, this helps with making balls out of the dough. Lightly grease a cookie sheet or line with parchment paper. Take tablespoon sizes of dough and place onto cookie sheet. Place cookie dough into the oven and bake for 10-12 minutes. Baked cookie dough will look a little un-cooked in the center and brown along the edges. Allow cookies to sit for 5-10 minutes on cookie sheet before enjoying this easy and delicious cookie treat! Return from Sunbutter Cookies to Food Allergies Home Page! Want more Cookie Recipes? Check out our Dessert Recipe Cook Book! Also visit our Dessert Recipe Page for more yummy treats!